Detects endogenous levels of total Chk2 protein. Synthetic non-phosphopeptide derived from Human Chk2 around the phosphorylation site of threonine 68. 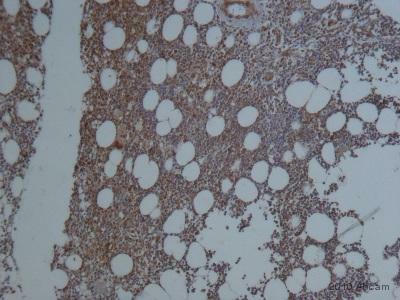 Human breast carcinoma tissue. Jurkat cell extracts. Affinity purified from rabbit antiserum by affinity chromatography using epitope-specific immunogen. Our Abpromise guarantee covers the use of ab47433 in the following tested applications. ICC/IF 1/200. Please see abreview for further details. WB 1/500 - 1/1000. Detects a band of approximately 61 kDa (predicted molecular weight: 61 kDa). ab47433 (1/200) detecting Chk2 in HeLa cells in conjunction with a goat anti-mouse secondary antibody conjugated to Cy3 (red). 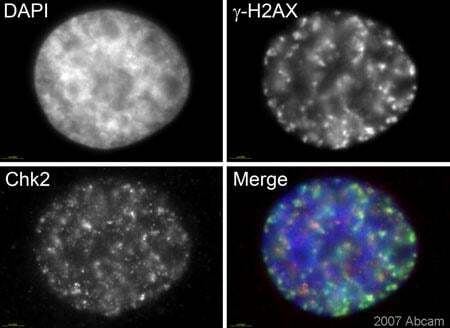 Cells were counterstained with DAPI in order to highlight the nucleus (blue), treated with Bleomycin and incubated with an antibody against Histone H2AX in order to create and expose DNA double strand breaks (green). Please refer to abreviews for further details. ab47433 at 1/100 dilution staining Chk2 in human breast carcinoma tissue section by Immunohistochemistry (Formalin/ PFA fixed paraffin embedded tissue sections). Right image show staining with ab47433 after incubation with specific peptide and left image show staining with untreated antibody. Publishing research using ab47433? Please let us know so that we can cite the reference in this datasheet.